Pattern: Coolbreeze Collection by me! 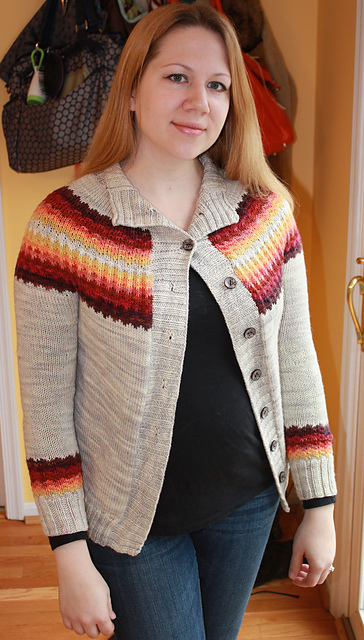 I first spotted this lovely adult version of my Coolbreeze Cardigan pattern (done in the Warmbreeze palette) and thought that it was so nice that I'd love to feature it in a TFA Tuesday blog post. 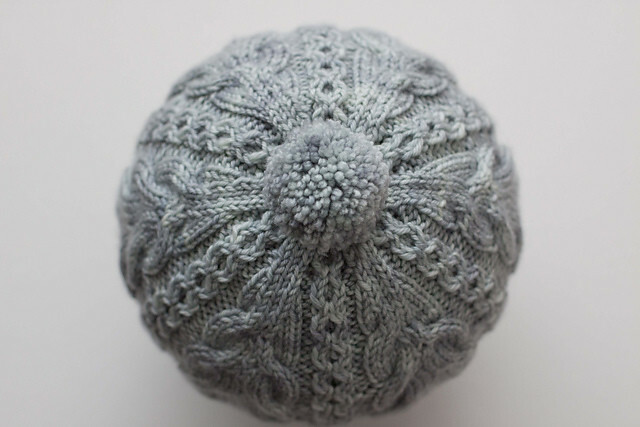 Then I jumped over the MediaPeruana's Ravelry project page and saw that she has also knit the wee version! That made my day. 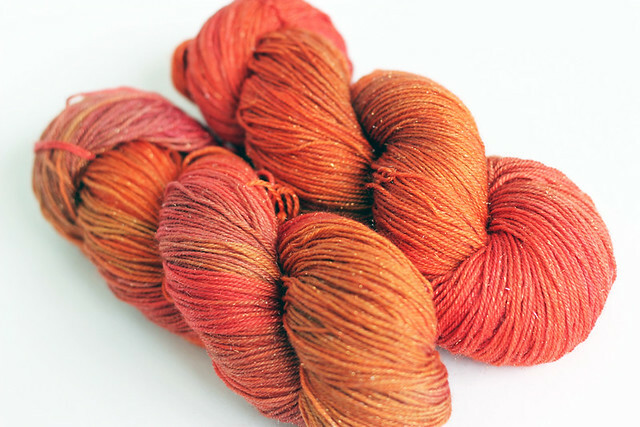 A family of gorgeous gradient cardigans, what more could you want? Both her adult and her baby version are gorgeous and bring me back to the days when Rowan still fit in his Baby Coolbreeze. 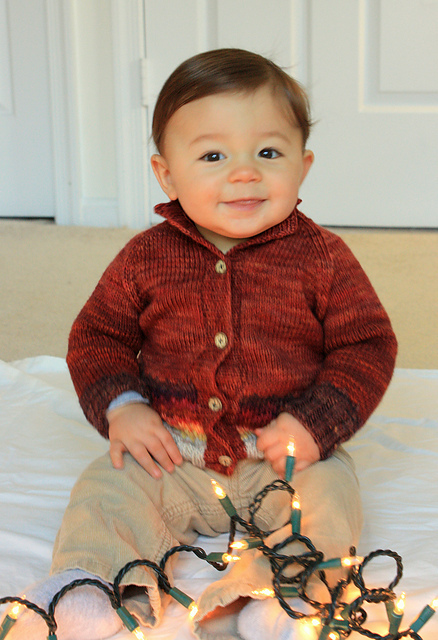 I think it's about time I knit him another so we can be twinsies again! 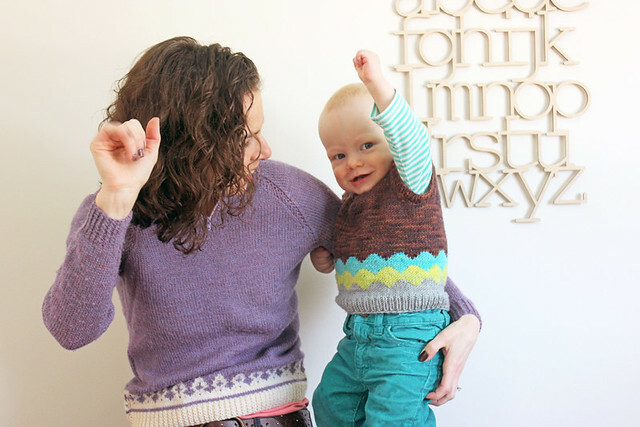 Featured Knits: My sweater - a vintage hand-me-down from my mom. 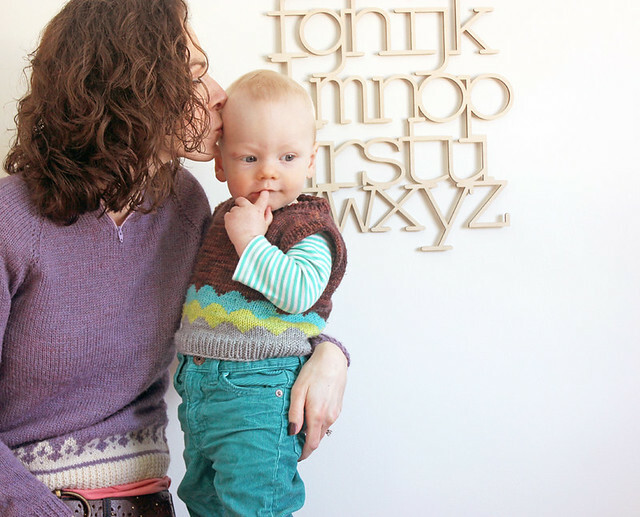 Rowan's vest - Schoolboy Vest - pattern coming soon! Yarn: My sweater - awesome vintage Scottish wool. 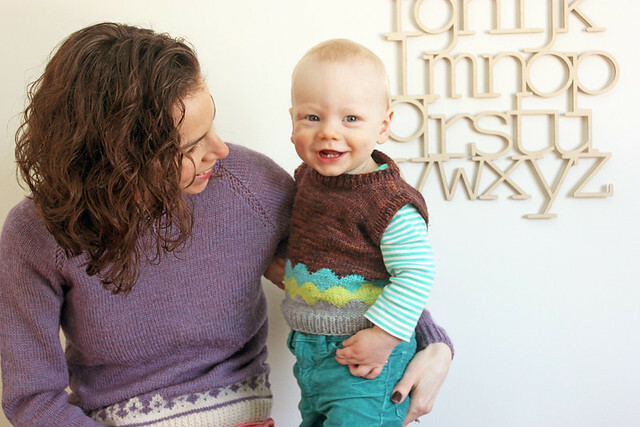 Rowan's vest - TFA Green Label Aran Weight in Chris Grey, Lemongrass, Seabreeze and Chestnut. So, Fashion Friday was supposed to be all about highlighting some of my favourite knits and discussing how I like to wear them in real life. 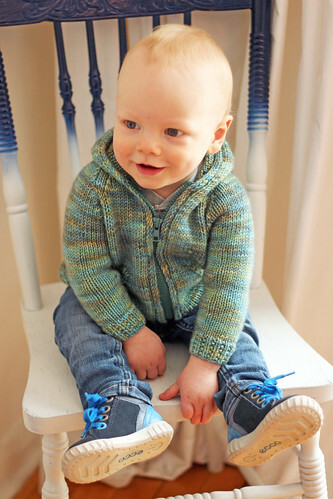 But lets be honest, this kid's got much better style then I do, and he wears a lot of knits, so from time to time lets chat about how he likes to style his knit-wardrobe shall we? Rowan, thankfully, is not afraid of a little colour. He can rock a pair of turquoise cords like its nobody's business. He wears a lot of stripes, often paired with more stripes, polka dots or in this case, scallops. He is also partial to vests. He has 3 and wears them all the time. 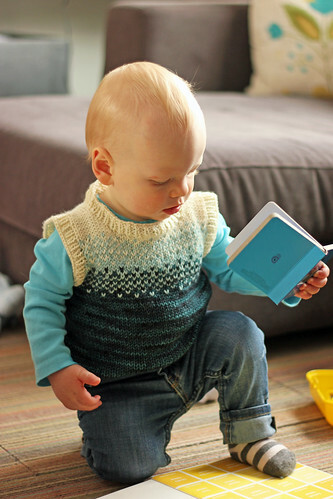 The vest he's wearing in these photos is the same pattern as this one, with modified colourwork. 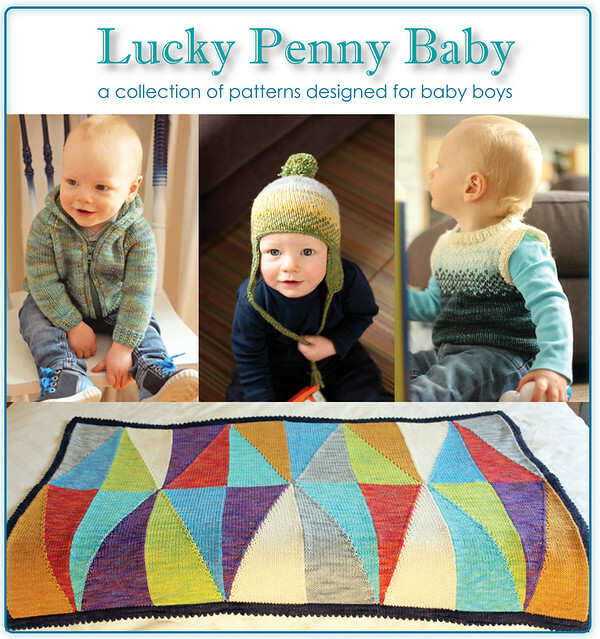 The pattern will be released as part of my upcoming baby boy collection soon (like within a week or two!) I cannot say enough about how much I love the baby vest look, it's adorable and incredibly practical. I will go on and on about it when I release the pattern I'm sure. So stay tuned for that! My sweater was knit by my aunt for my mother years ago. 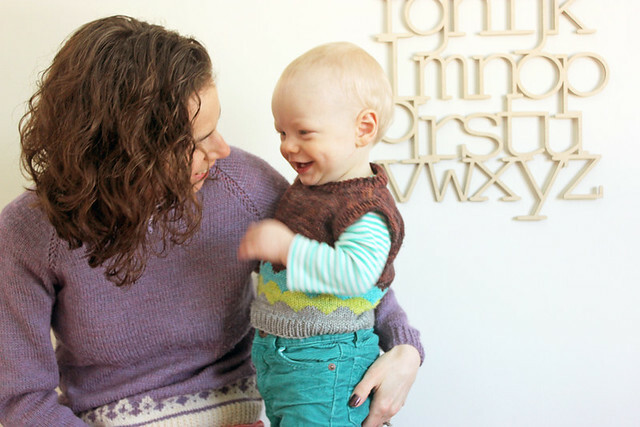 It was knit with 100% Scottish wool yarn, that's all I know about it, and I am continually amazed at how well both the yarn and the style of this sweater have stood the test of time. Aren't classic pieces like this amazing? Knitting a sweater is a big commitment, but when it lasts years and gets passed on through generations I would say it's more than worth the effort. 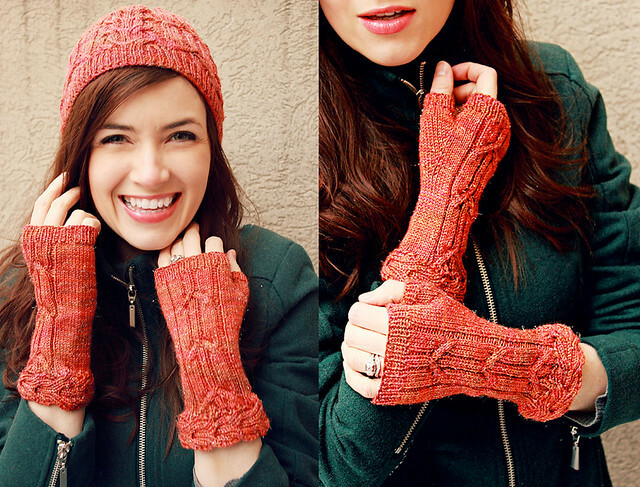 I've made it my personal mission to make sure that I design and knit at least a few pieces like this in my career. I really can't think of anything more awesome than having a grown daughter one day who loves to wear my hand knit hand-me-downs. 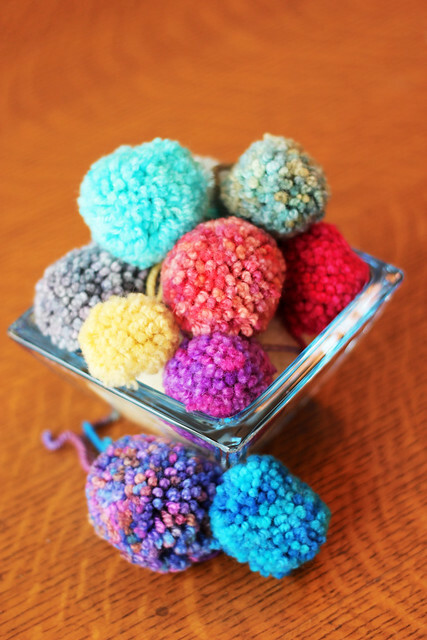 1 :: I use a pompom maker. 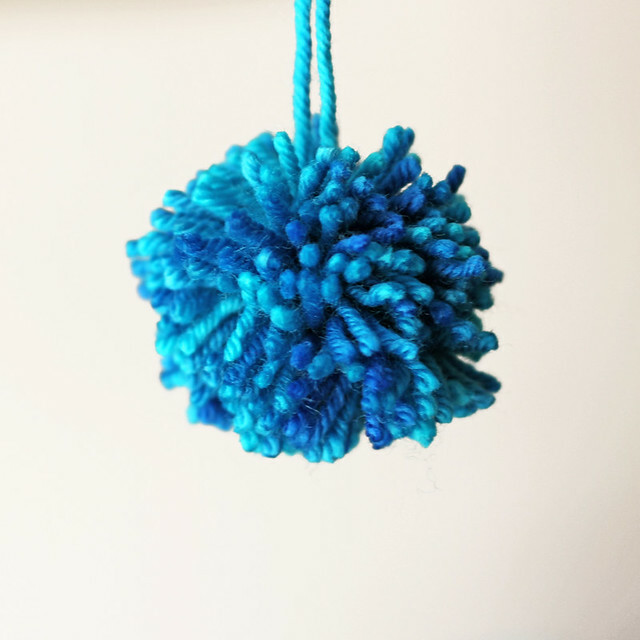 Absolutely not a necessary tool, you can make perfect pompoms by wrapping the yarn around just your fingers or a piece of card board. But I have this one and I love it. 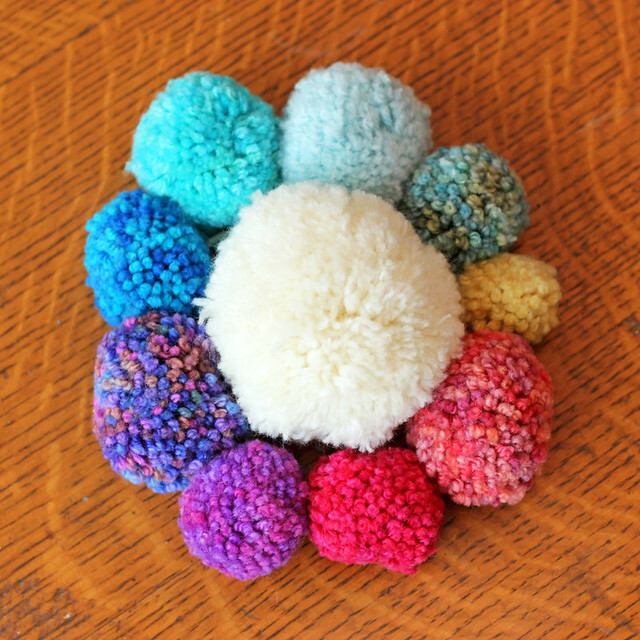 It requires a lot less trimming and fussing and makes really lovely and round pompoms in a variety of sizes every time. If you love to pompom as much as I do, it's worth the couple bucks. 2 :: Simply follow the instructions, wrapping the yarn around the two halves of the pompom maker, then fitting them together, cutting your loops and tying it off in the center. For the tying off part I almost always enlist the help of another person, pompom making is made a lot easier if you have 4 hands! In the picture above, and in the picture below, the pompoms haven't had any extra trimming. See what I mean about how the pompom maker helps to minimize trimming? It's almost a perfect sphere as is. 3 :: Next is my secret step. 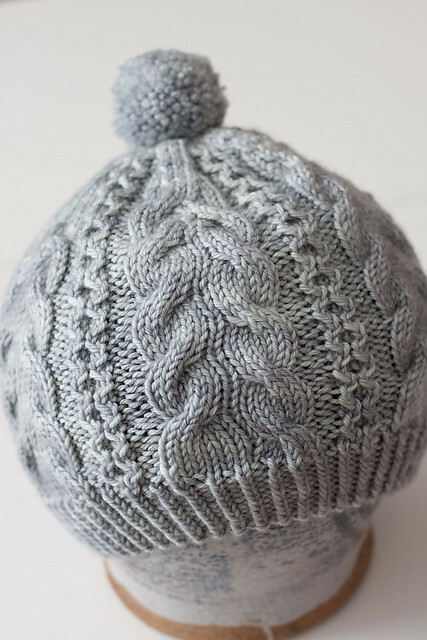 The step that takes a "perfectly respectable" pompom over the top to pompom perfection! 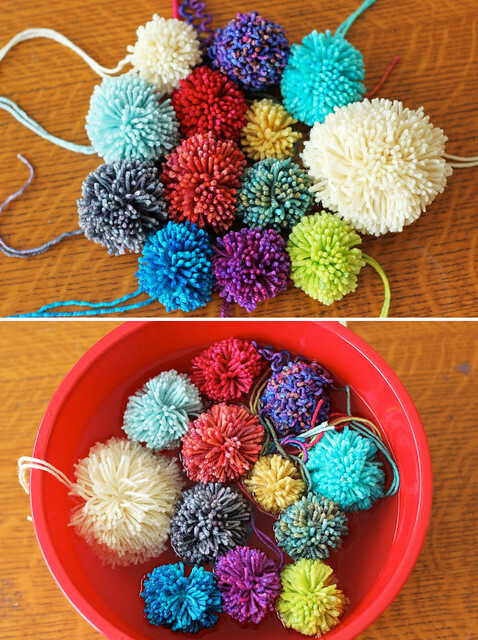 Soak the pompoms in lukewarm water until they are completely saturated. About 20 minutes. 4 :: When they are thoroughly soaked, squeeze them out, put them in a mesh dryer bag, and throw them in a hot dryer to tumble dry for 30 minutes or until they are completely dry. I really have to emphasize the mesh bag for this step, you know the kind that you might use to wash pantyhose and such? 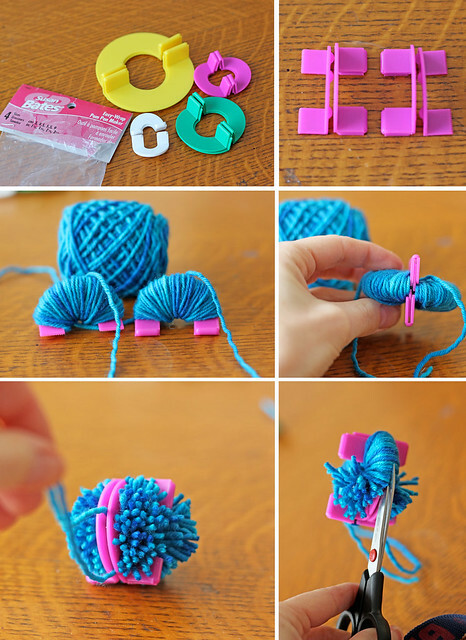 In case one of your pompoms doesn't make it through to the other side this will save you from having to pick out hundreds of little pieces of yarn from your dryer. You see that lovely Lemongrass pompom up there? Sadly, it didn't make it. In putting together this tutorial I experimented with Green Label, Yellow Label and Orange Label pompoms, the Orange Label did not hold together well. I'd recommend sticking with wool yarns for this method, the cashmere and silk in the Orange Label seem to make the pompom too slippery to hold up to the tumble drying. Even though Green Label and Yellow Label are superwash wool, which is much more slippery than non-superwash wool, it's got just enough stick to not give you any trouble in the dryer. This is also where that second pair of hands is useful, you can cinch the pompoms much tighter with a little bit of help. 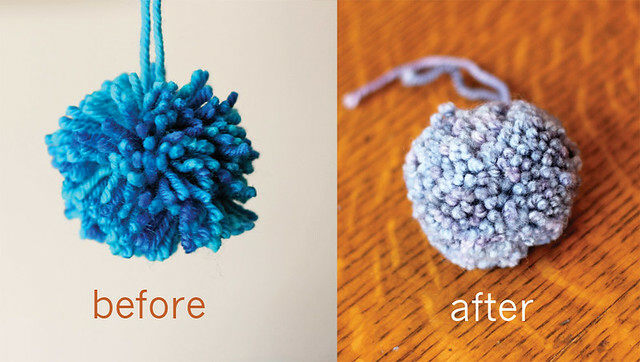 On the left in the above image is the pre-tumble dried pompom, and on the right is one fresh out of the dryer. Big difference right? It just looks so much fluffier and full of life. The dryer takes all those snipped ends of yarn and separates the plies to give you a really healthy looking pompom. So there you have it. My pompom secrets revealed! I Hope you'll give this method a try the next time you've got a knit that needs a bit of embellishment. Happy pompom Wednesday everyone! 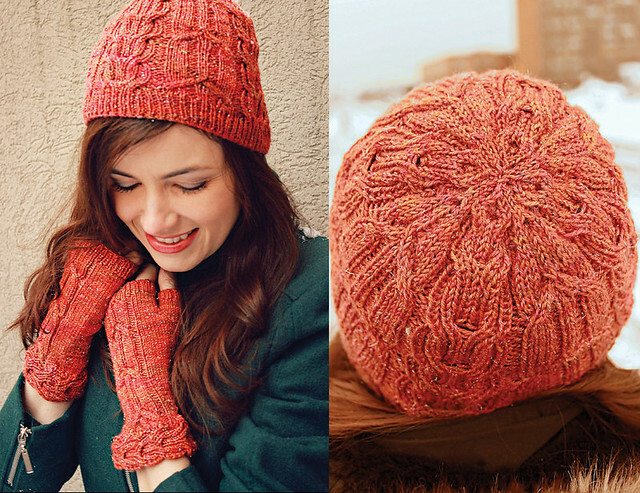 Pattern: Woodhollow Hat and Mitts by Kirsten Kapur. Yarn: TFA Green Label Aran Weight in Chris Grey. 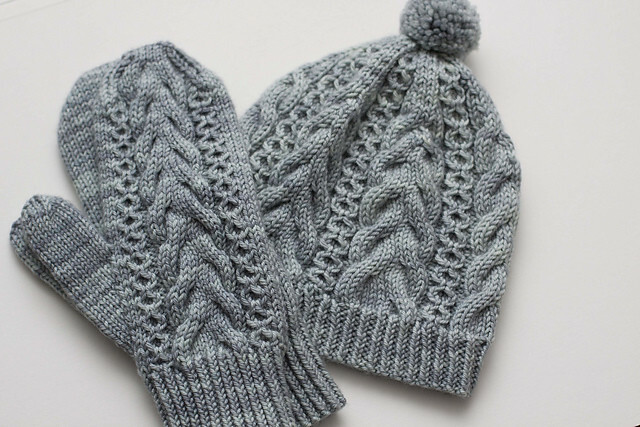 This set makes me want to stop everything I'm working on and knit an awesome pair of cabled mitts with a coordinating hat. The pattern is so pretty and simple and crisp and perfect. This is the sort of pattern that would look great in any colour and could certainly add a pop of colour to a dull winters wardrobe if worked in a brighter hue, but I am so in love with the subtle, modern, laid back feel of this set in Chris Grey. So chic. Oh, and the pom-pom doesn't hurt either! Just look at that shot. 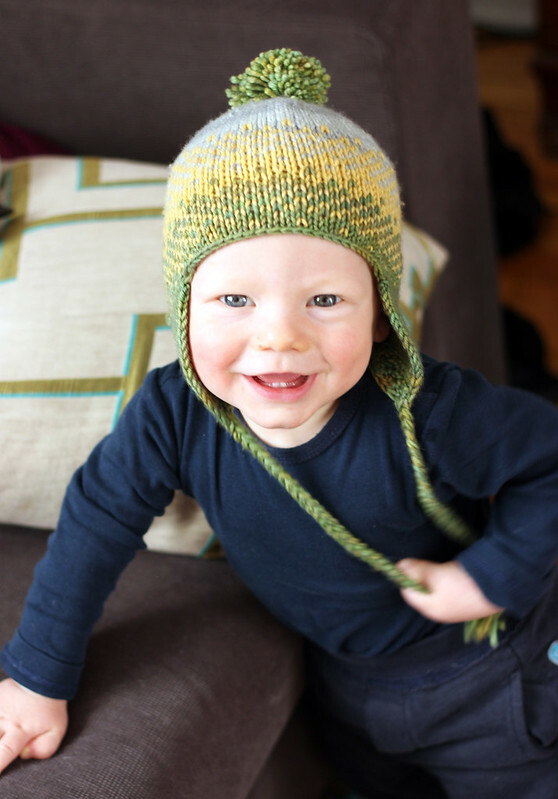 Sheer hat knitting perfection! Calling this post "Frolic Update" is kind of unfair because it gives the impression that there is some sort of exciting update about to be revealed. I just couldn't bring myself to call this post what it's really all about... "No Frolic for me". Sad face. I feel terrible admitting defeat, I had every intention of packing up the family and driving to Toronto for the weekend, but as the months went by and the Frolic inched closer and closer I knew I was lying to myself. It's just too much for us at the moment. I feel like I say that a lot lately. Doing wholesale at the scale that we used to is too much, doing shows is too much... Why is it so hard to know our limits and just say no sometimes!? Because we want to do it all, right? Well, I just can't. I've accepted it and am actually feeling really good about it. I mentioned in this post a few weeks back that things with TFA haven't always gone exactly as I had planned, but that the way they've ended up is definitely the way they should be. And I stand by that. I used to think that I could do a little bit of everything, but that has not worked for me. It's all good though, in learning what works and what doesn't work, what we love to do and what feels like too much effort, we've been able to streamline where we focus our attentions and we are all the better for it! And I really mean that. 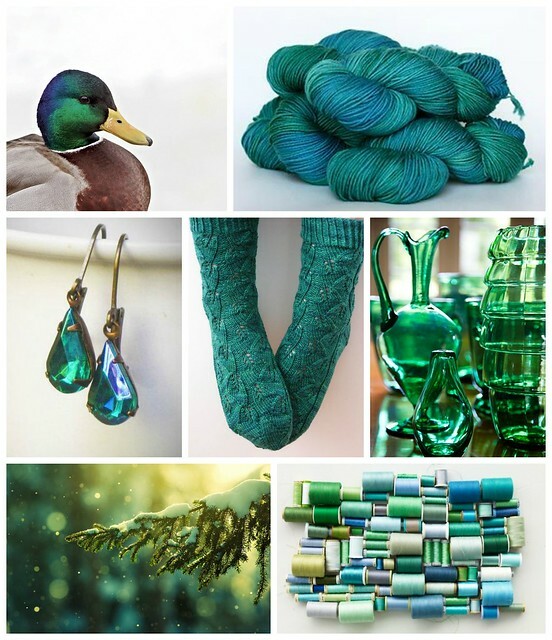 I think that we are producing higher quality colourways and patterns these days, and when that happens, everybody wins! Instead of being completely bogged down by overwhelming tasks we're being realistic about what we can manage and are focussing on doing fewer things, better. So though I won't see you at the Frolic this year, I am still cooking up a plan to have some new TFA available for you there. 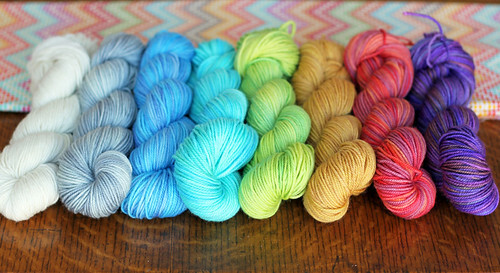 The Purple Purl will have new TFA offerings in their booth, so you'll still have a chance to get your recommended dose via them! This child is growing way too fast. 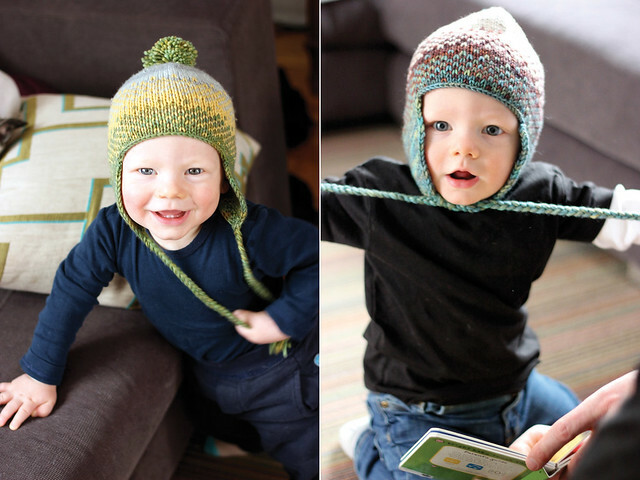 The photo on the left was taken less than a month ago when Rowan still fit in his adorable little hat. 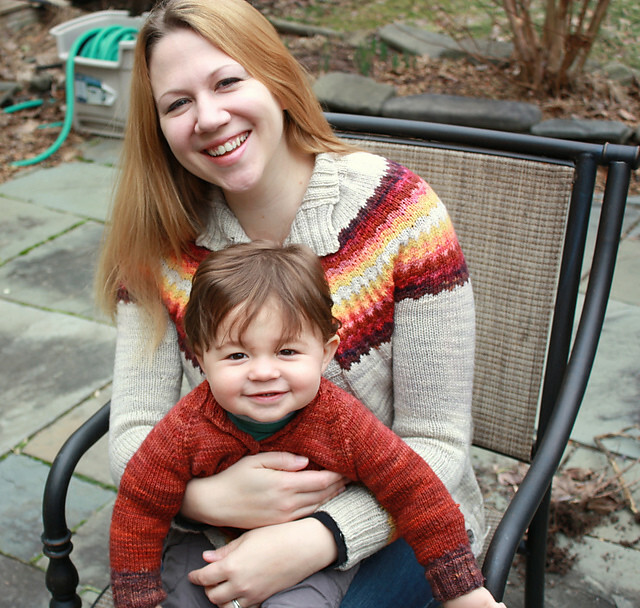 I've knit another in a size larger so I could get some good pattern shots and get this pattern published already. Rowan has decided that he's so over being a baby model. Instead he's a baby rebel who will do whatever it takes to make photographing him in focus nearly impossible. Oh boy do I love that face! 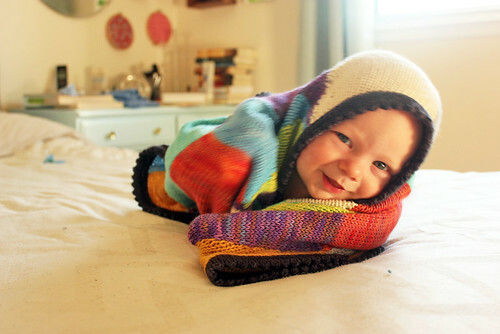 Excuse me while I go kiss those cheeks. 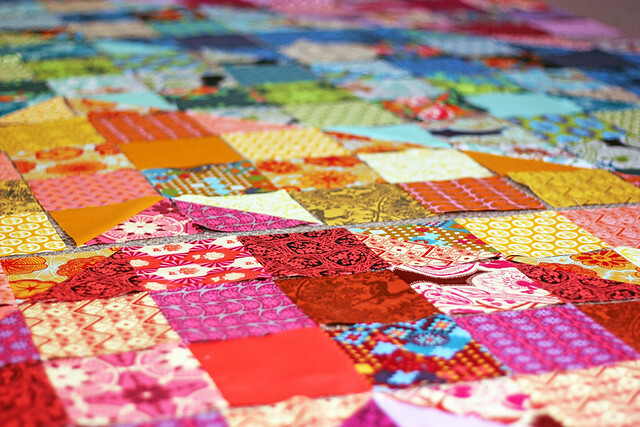 Last week I posted a photo of a stack of fabrics that were destined to become a Colour Dive Quilt. (I bought the kit here.) 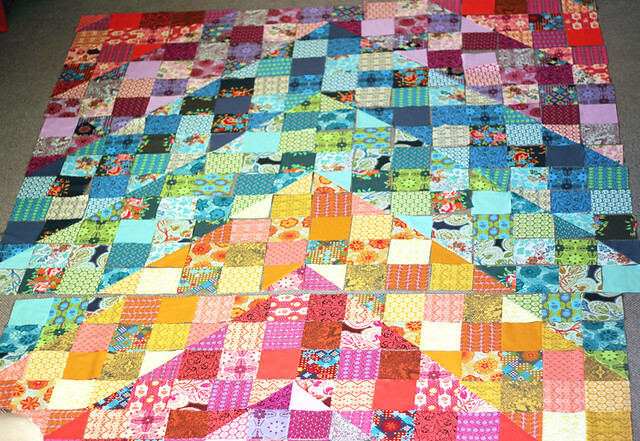 And then Saturday I spent a solid 12 hours cutting, sewing, pressing, organizing and then sewing and pressing some more until I had the better part of a quilt top complete. Man, what a day! 1) I like to sew almost as much as I like to knit. I'm scared of sewing machines, but my mom is a real pro, so with her handy to help if something goes wrong, I am in heaven. In terms of sewing I prefer quilts, bags, stuff doesn't have to fit. :) Incidentally, one of my favourite sewing projects to date is a Multitasker Tote that I made a few years back, also with an Anna Maria Horner pattern and fabrics. AMH is my girl! 2) I am a tad insane when it comes to my crafting stamina. 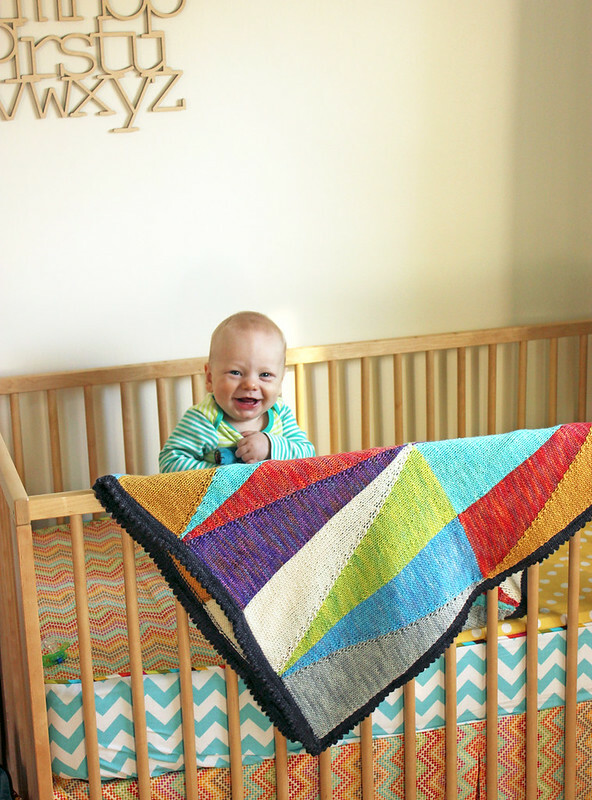 I worked on this quilt, only stopping to feed the baby, feed myself, or go to the bathroom, from 8:30 am until 8:30 pm. I could have worked longer, but alas, I think that 12 hours of baby-neglect is probably enough for one day. Rest assured, Rowan was in very good hands with Chris, my mom and my sister taking care of him, so it wasn't total neglect. One more marathon session and I'll have this quilt top complete. I am so crazy for the colours and the prints. The way that they come together is magical. What did you all do this weekend? Any crazy craft-a-holics like me out there? 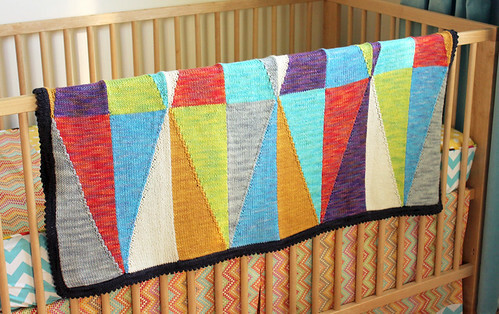 When a baby is born, the knitting plans begin! There is a new baby boy in my extended family, so I'd better get busy! 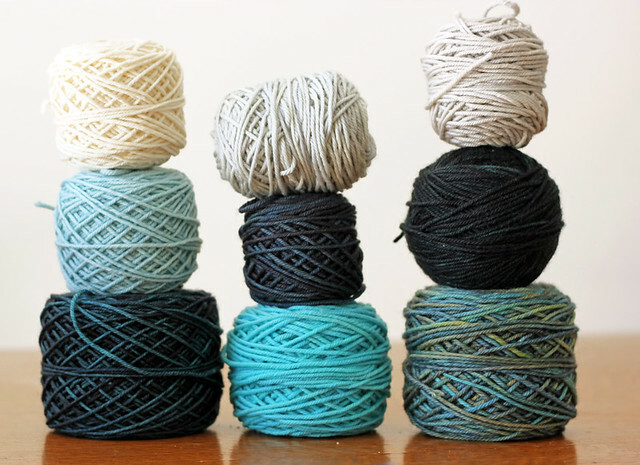 I hope to turn these piles of yarn into a small pile of knits this week.